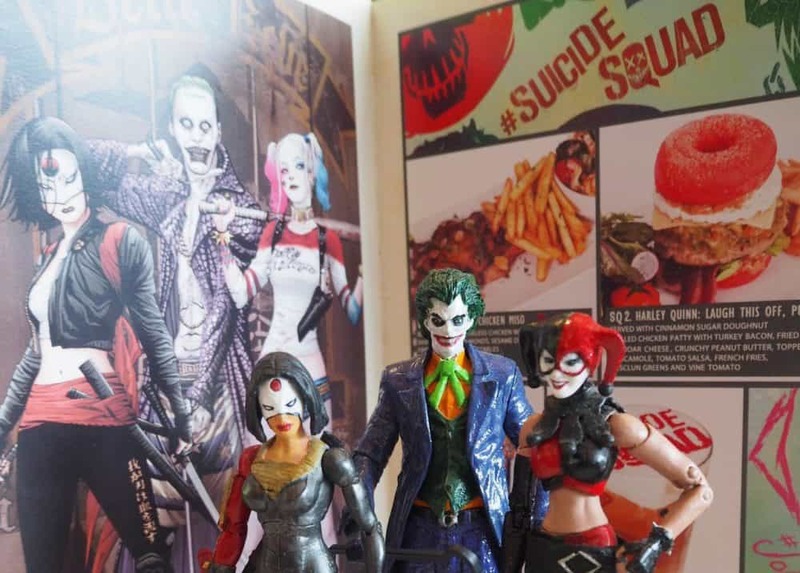 Following the tie-in menu launched to commemorate the release of Batman v Superman: Dawn of Justice earlier this year, the DC Comics Super Heroes Café at Marina Bay Sands Singapore is serving up food items inspired by the Suicide Squad movie. F*** was at the restaurant earlier yesterday afternoon, having worked up an appetite for antiheroes. First up was the Katana Cut Chicken Miso ($38.90, serves two). The dish of roasted spring chicken with white miso, sake, shaved roasted almonds, sesame dressing, seasoned fries and garden vegetables sounded tasty, but this certainly didn’t make the cut. The miso and sake barely registered, and the chicken lacked the picture-perfect charred edge finish we were expecting. Your mileage may vary of course, but it didn’t seem like it would be filling enough for two diners to share as a main course. A dish themed after the peerless swordswoman Tatsu Yamashiro should’ve been sharp and crisp rather than bland and dull. The Joker’s Rainbow Freak Shake ($16.90), a combination drink/dessert concoction, is eye-catching. While the Clown Prince of Crime is known for his green hair and bleached skin, we get more than a few extra colours here. The vanilla-based shake is topped with rainbow sprinkles, white chocolate sauce, gummy bears and a chocolate wafer stick. All those wild colours are merely decorative however, and it tastes like your average vanilla ice cream milkshake. It’s visually exciting but boring on the palette – let’s hope Jared Leto’s portrayal of the Joker doesn’t mirror this. The caffeinated beverage Sweet-Side Squad ($14.90) emerged as the winner of the day by a country mile. Local flavours influence the drink, which comprises layers of Gula Melaka (coconut palm molasses), milk, black tea and a shot of espresso. It’s reminiscent of Yuanyang, known in Malaysia as Kopi Cham, a mixture of tea coffee. There’s a great comfort factor in Gula Melaka which this reviewer finds irresistible, especially when drizzled over sago pudding with coconut milk. Mmm. Lest we digress, the Sweet-Side Squad does taste predominantly of coffee, with the black tea registering as a pleasant aftertaste. Looking at the colourful cast of characters in the film, we couldn’t help but think the DC Comics Super Heroes Café had missed a few opportunities. How about El Diablo Hot Wings, Captain Boomeringue Lemon Tart, Amanda Waller Waffle Stack or Killer Croc Bayou Gumbo? And then there’s the obvious choice of Harley Quinn’s Puddin’ – maybe it was too obvious. DC Comics Super Heroes Café has an ongoing promotion from now till the 29th July: spend a minimum of $200 on food and beverages in a single day and stand a chance to win one of ten pairs of tickets to the film’s Singapore premiere. The lucky draw will be held on 30th July, with the film’s premiere held on 3rd August. Suicide Squad opens in Singapore on 4th August 2016. – Words & Photos by Jedd Jong. Custom action figures are the writer’s own.